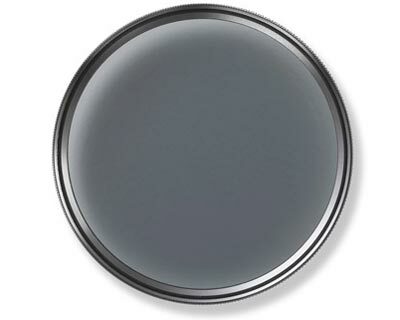 Circular polarization filters from Carl Zeiss can minimize reflections on non-metallic shiny surfaces (e.g. water, glass, plastic, paint or leaves). Reflections are avoided, higher color saturation and richer contrast is achieved. Haze is eliminated in landscape photography, the sky is bluer and better color separation is enabled. The effectiveness of a polarization filter depends on the taking angle to the reflecting surface and the position of the filter. Therefore, POL filters are equipped with a screw mount. This allows configuration of the desired filter effect before taking a picture with an SLR camera. Visible light is reduced by 1.5 - 2 EV (filter factor 3-4) depending on the position of the filter on the screw mount. On all camera models, circular polarization filters ensure that TTL exposure metering and the autofocus function work properly regardless of the filter rotation.